Co-creative projects originate in partnership with participants rather than based solely on institutional goals. A community group may approach the museum seeking assistance to make a project possible, or the institution may invite outside participants to propose and work with staff on a project of mutual benefit. Rather than the institution declaring, “we want to do an exhibit on potato farmers, please come and help us make it happen,” staff members ask, “potato farmers, do you have an idea for an exhibit you’d like to make with us?” Or the potato farmers approach the museum on their own accord. While co-creative and collaborative processes are often quite similar, co-creative projects start with community as well as institutional needs. Co-creative projects progress very similarly to collaborative projects, but they confer more power to participants. Staff members and community partners work closely to achieve their shared goals. The project development process is often co-determined by the preferences and working styles of participants. The result is a project that is truly co-owned by institutional and community partners. The Wing Luke Asian Museum in Seattle, WA, has a well-documented, longstanding commitment to co-creative exhibition development. Their community process is based on a dedication to empowering community members to tell the stories that are most meaningful to them, and community members are engaged in every step of exhibition development. The Wing Luke has been recognized for its achievements in participatory exhibition development, but it has also received honors for producing exemplary audience-facing exhibition products. 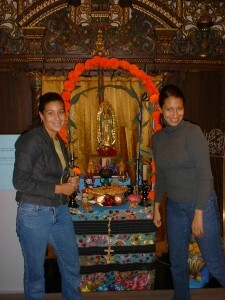 In 2002, the community-directed exhibition If Tired Hands Could Talk: Stories of Asian Pacific American Garment Workers, which featured first-person narratives collected and designed with a team of fifteen garment workers, was named best exhibition by the Western Museums Association. This is an institution that knows how to use a co-creative process to create high quality products. 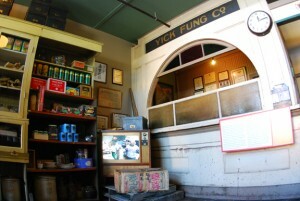 The Wing Luke Asian Museum includes this 100-year-old preserved import-export store. The TV in the middle of the exhibit features the stories of Jimmy Mar, former owner-operator of this local business. Photo by Dean Wong, courtesy of the Wing Luke Asian Museum. There has always been an assumption that the work that we do should be guided by the community here and now. There is an assumption that the museum is a portal for reflection for the outside world rather than a fortress of knowledge that people enter. There has been an assumption that change and the development of the relationships that we need to do our work will take a long time. We are not about stuff and projects but about relationships and stories that rise up from the community. The story is more important than the stuff. The museum is more a place of dialogue than stated facts. Ron has given me a lot of pride in being Filipino. He’s put forward the history and contributions of our people. We’re no longer just a bunch of these people who went to the canneries every summer . . . we helped build this country. For Veloria and others, the Wing Luke Asian Museum is an essential community institution, and its co-creative exhibition model is at the heart of that sense of belonging and ownership. The Wing Luke community process is simple to understand and hard to implement. Their handbook reads like a Zen koan: “The work is labor intensive. The work requires flexibility. We willingly relinquish control.” The staff puts top priority on relationships with the community, and exhibition projects involve extensive and sometimes contentious deliberation as community members from diverse backgrounds come together with staff to turn their stories into visitor experiences. The exhibit development process is facilitated by staff but steered by the Core Advisory Committee (CAC). The content, timing, and decision-making process for each project changes based on the dynamics and needs of the particular community with whom each project is developed. The CAC is “the primary decision-making body within the Exhibit Team, and are charged with developing the main messages, themes, content and form of the exhibition and its related components.” A community member, not a museum staff member, leads the CAC. Once the overall concept is defined, the CAC recruits other members of the community to contribute artifacts or stories, perform research, and provide outreach programming for the exhibition. Meanwhile, the staff provides support in design, research, and community facilitation. Staff members often manage interpersonal relationships alongside shifting project schedules. Museum staff members lead design and fabrication, with CAC members offering input and curatorial direction over artifact selection, multi-media story creation, and general design to ensure it remains in line with exhibition goals. CAC members are invited to drop by at any point during fabrication and installation and are occasionally asked to help install particular artifacts or elements. There are special opening events for all participating community members, and participants are solicited both formally and informally for evaluation on the exhibitions. In addition, community members often develop and lead educational programs alongside volunteers and staff members during the run of each exhibition. Because the co-creative process is the only way that exhibitions are developed at the Wing Luke Asian Museum, the audience experience is not differentiated from that of other types of exhibits or programs. The audience is considered in exhibition design insofar as the co-creation process is set up to deliver a product that is meaningful and relevant to a range of diverse communities. The museum performs summative evaluations of all exhibitions, measuring audience numbers and impact as well as growth and impact of new community connections. We observe significant community participation in museum programs. Community members return time and time again. People learn and are moved through their participation in museum programs. People see something of themselves in our exhibits and event. People become members of the museum. People contribute artifacts and stories to our exhibits. The community supports the museum’s new capital campaign. Constituents are comfortable providing both positive and negative feedback. The museum’s internal hiring and training practices also reflect their overall focus on community engagement. The Wing Luke Asian Museum hires people for relationship-building skills as well as content expertise. They put a priority on staff continuity, diversity, and cultivation of young staff as future leaders. The staff is trained extensively in dialogue and community-response techniques to help them carry out the museum’s mission. At the Wing Luke Asian Museum, co-creation and community partnership is a way of life, infiltrating all its efforts, from exhibition design to board recruitment to fundraising. Staff members and participants respect each other’s goals and interests in pursuing the project. They should create a set of shared guidelines for what is and isn’t acceptable and expected over the duration of the project. Staff members should not harbor pre-conceived ideas about the outcome of the project. They should be willing to let the project go in the direction that is of greatest value to participants, within the scope of the project guidelines. A group of game designers who call themselves antiboredom used this technique to devise a popular co-creative platform called SFZero that allows amateurs to design their own games. The antiboredom team got their start in Chicago designing complicated puzzle games. They knew people enjoyed playing their games, but they realized that the real fun, at least for them, was in making up the puzzles and game challenges. So they decided to develop a game that let people make their own games, and SFZero was born. SFZero is a “collaborative production” game in which people perform creative tasks in an urban environment. The players design the tasks, perform them, and keep score by assigning points to others’ documentation of their task fulfillment. The players are also the audience for each other’s tasks and their attempts to complete them. Tasks tend to be short, evocative, and a bit transgressive, such as “distract the mailman,” “reverse shoplifting (insert an object into a store),” or “create a permanent and visible neighborhood tattoo.” Some tasks are personal, like “make a sound portrait of yourself,” while others encourage people to explore new places or learn new skills. The antiboredom team does not design the individual game tasks. Instead, the staff manages the community website on which players propose new tasks and share stories about the ones they have completed. This allows the antiboredom team to focus on encouraging new players, providing guidelines, and improving the tools that support the game. Staff members provide the scaffolding that empowers players to co-create their gaming experience. 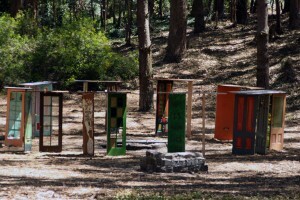 In response to the task: “Install a door in a public place,” a group of SFZero players constructed Doorhenge in Golden Gate Park. The artwork stayed up for two months, aided by occasional cleanup and reconstruction by dozens of SFZero players. Photo by anna one aka Alanna Simone. Co-creation projects run into trouble when participants’ goals are not aligned with institutional goals, or when staff members are not fully aware of participants’ goals at the outset. When community members come forward with an idea for a project, the discussion often quickly jumps to the how of participation without a full investigation of the why. Visitors and staff members often have very different ideas about how cultural institutions work and what they do. If someone comes in saying he wants to make an exhibit based on his community’s experiences, it’s important to find out what that means to that individual and whether his goals are truly aligned with institutional goals. Wikipedia Loves Art is a good example of a co-creative project in which institutions and participants struggled to understand each other’s goals. It was a short-term co-creation project that first took place in February 2009. It started with a request from a group of New York Wikimedians (members of the Wikipedia community) to the Brooklyn Museum. The Wikimedians asked if the museum would coordinate a project in which people could photograph copyright-free artworks in cultural institutions to illustrate Wikipedia articles. The museum agreed and brought fifteen institutions from the US and UK on board to participate. The museums asked Wikimedians to provide the institutions with lists of thematic topics that required illustration. Museums used these thematic lists to develop scavenger hunt lists to distribute to participants so that they might find art objects to illustrate Wikipedia topics like “Roman architecture” or “mask.” Participants were asked to photograph objects and their accession numbers so staff members could identify and describe the objects properly. The museums developed careful rules about what could and couldn’t be photographed, and how participants could upload their images to Flickr for use by the project. The Wikimedians’ and museums’ goals were not as aligned as they originally thought. Museums saw this project as an opportunity to engage local photographers to think creatively about how artworks might represent different topics. In contrast, the Wikimedians’ goal was to make cultural content digitally available online using as open a licensing structure as possible. The museums cared about participants connecting with artworks and identifying them properly, whereas the Wikimedians cared more about participants sharing images under open legal licenses. From the institutional perspective, the best way to deliver good participant experiences was to limit contributions through the Flickr uploading system. Institutional representatives were concerned about losing control of images of their collections, and they wanted to make sure the images were linked to the correct information about each object. But many Wikimedians were confused or frustrated by what they perceived as arbitrary institutional constraints in the submission format. Some people invented their own rogue ways to upload museum images outside of the project framework. This caused concern for museum representatives, who saw these actions as causing confusion and potentially violating intellectual property agreements. Using accession numbers to identify the objects also created a massive and unexpected amount of work for institutional staff. One hundred and two photographers at fifteen different institutions submitted over 13,000 photographs, documenting about 6,200 pieces of art. While these participants had done the hard work of capturing the images, it was up to the institutions to validate, tag, caption, and prepare them for Wikipedia’s use. This was a Herculean effort, and some staff members were unable to verify the majority of the images captured at their institutions. At the Brooklyn Museum, data processor Erin Sweeney used a ten-step process for determining whether an image was a valid contribution. After determining validity, Sweeney added tags to the images to identify the objects with which they were associated, the number of points the team received for the images, and more. Eventually, all the work was completed, but when the dust settled, the overall effort by institutions involved in Wikipedia Loves Art was so great that many saw it as an unsustainable collaboration. The museums knew exactly what would be photographed and could more tightly control the experience. At some institutions, staff members set up specific dates for photography and escorted photographers through the galleries. The Wikimedians knew that all the images would be legal for use from a copyright perspective. There was no concern about museums needing to verify that an object on the list was legal for use. The participants received a numbered list of objects to photograph and could tag their images with these identification numbers instead of with accession numbers. This significantly reduced the number of object identification errors and reduced the staff time required to review the images submitted. I joined because I feel very strongly that museums should make images freely available. So I consider it a success that images of works by Van Gogh and Bosch can now be used by everyone legally (a series of very interesting contemporary works from the private collection of a bank have come out into the open too). By simplifying and constraining the project, Wikipedia Loves Art / NL sustainably engaged art institutions, Wikimedians, and photographers in co-creation. Wikipedia Loves Art events are continuing to be planned and implemented at museums around the world. The co-creative partnerships will continue to evolve as museums and free culture advocates work together to define how to open up cultural content to a wider digital audience. More than any other type of visitor participation, co-creative projects challenge institutional perceptions of ownership and control of content. Co-creative projects require “radical trust” in community members’ abilities to perform complex tasks, collaborate with each other, and respect institutional rules and priorities. To execute a successful co-creation project, staff members must not only trust the competencies and motivations of participants but deeply desire their input and leadership. There are several museums where co-creation occurs in pockets, and these pockets tend to reside in education departments. Education staff members are more likely to be hired in part for their ability to be responsive to and collaborate with community partners and program participants. Educational programs traditionally focus on deep engagement with content, and co-creation fits into that overall mission. Unfortunately, these programs run the risk of isolation, and some education departments can become “participatory ghettos” within larger, more traditional institutions. What happens when staff members across a cultural institution have different perspectives on how much trust to put in community participants? Consider the story of the St. Louis Science Center’s Youth Exploring Science program (YES). YES is a community-based program in which 250 under-served teenagers, recruited from community partner organizations, are employed by the science center to participate in science learning, professional development, and service back to the community. Adult employees of the YES program work in partnership with students, and while they definitely provide some formal instruction, they do so in a co-creative environment that is frequently teen-led. For example, in the Learning Places project (funded by the National Science Foundation), YES teens designed, installed, and staffed interactive science exhibits and activities for local community children’s organizations. YES teens are empowered to manage their program’s digital presence by publishing content on several public social networking sites. Because the YES staff has a co-creative approach to relationships with YES participants, there are fairly loose guidelines for what teens may post, and participants share everything from reflections on their science learning to photos of themselves dancing. In the context of YES, these activities are both appropriate and desirable because they promote technology skills and help YES participants feel ownership of their program. But YES staff members have clashed with the marketing department of the St. Louis Science Center about their online presence. From the marketing perspective, YES teens are not the most appropriate spokespeople for the institution across the social Web. The YES website has not been integrated into the overall Science Center website, and accessing it via the museum’s website requires some concerted effort. While the YES program powerfully fulfills the museum’s mission “to stimulate interest in and understanding of science and technology throughout the community,” it is not presented as a flagship to audiences that are not already in the know. These kinds of conflicts are common in institutions that do not have a unified vision of their relationships with constituent communities. Institutions that are just beginning participatory projects of any type should expect to confront these kinds of challenges. In the best cases, the staff can use them as an opportunity for internal dialogue about what the institution’s eventual strategic policy on participation will be. At the Oakland Museum of California, a co-creative project in the education department became a vehicle for institutional change. The Oakland Museum has a long history as a community-focused institution, reaching back to its roots as a radically democratic museum in the late 1960s and 1970s. In the 1980s and 1990s, however, audiences plateaued, and in 2005, the museum began a major redesign process (to be completed in 2012) with the goal to reinvent the institution as a model institution based on strong community engagement. The museum had ambitious goals for increasing visitation, and specifically, for increasing the number of local visitors and visitors who are demographically representative of the museum’s highly diverse neighborhood. The staff also wanted visitors to see the Oakland Museum as a home for diverse voices—including their own. To accomplish these goals, the museum took inspiration from a long-standing co-creative project: the Days of the Dead exhibition. Days of the Dead embodies many of the goals and outcomes that the staff has for institutional reinvention. It is a program that involves diverse community members as participants and draws a large, enthusiastic, and multi-cultural audience. Days of the Dead is a community exhibition and celebration that the museum’s education department has run annually since 1994. Education staff members partner with local artists, community members, and outside curators as guest curators, and these guests assemble diverse artists, school groups, and community members to build shrines, or ofrendas, as offerings to the dead. The shrines are mounted in a dedicated exhibition space within the museum, and they range from funny to heart-wrenching to political in tone. The exhibition typically is open for two months surrounding the Day of the Dead (November 2) and features regular gallery talks and tours by participating artists. The museum hosts a community celebration on a weekend-day before the Day of the Dead, a free event that includes crafts and demonstrations, live music and dance performances, a market, and a ceremonial procession into the museum gardens. Staff member Evelyn Orantes and youth intern Blanca Garcia created this traditional ofrenda at the entrance to the 2003 Days of the Dead exhibition, Global Elegies: Art and Ofrendas for the Dead. Photo courtesy Oakland Museum of California. Days of the Dead was conceived by the institution’s Latino Advisory Council. The staff had approached this consultative group of community leaders and asked what they could do to connect with a broader Latino audience. The Council suggested a Day of the Dead program. Day of the Dead is one of the most important traditions in Latino Mexican culture, one with the potential to bring diverse communities together for shared healing. Why, asked the Latino Advisory Council, couldn’t the Oakland Museum become the home for Day of the Dead in San Francisco’s East Bay, where many Latinos live? Days of the Dead and the community celebration are enormously successful programs. The museum teems with local visitors speaking many different languages. On the day of the celebration, 3,000 to 5,000 people come to participate, and close to 7,000 visitors tour the exhibition annually, mostly in student groups. It’s the only exhibition at the Oakland Museum that requires a waiting list for bookings. The topic of death transcends culture or ethnicity. It’s something we all grapple with. And here is an educational institution providing you a safe way to gather tools to grieve. The exhibition has a real intimacy that you get right away—about your mom who died, or your child. The instant level of intimacy from the subject adds this whole other closeness between the museum, participant, and the viewer. It’s a program that makes people feel like this is their place, their museum, and there’s a sense of ownership. The Oakland Museum’s experience with Days of the Dead helped staff members articulate what was and wasn’t possible across other galleries during the transformation. The Days of the Dead co-creative process, like that at the Wing Luke Asian Museum, is highly deliberative and time intensive. While some redesigned galleries at the Oakland Museum will include fully co-creative projects, most visitor participation will be contributory or collaborative in nature. Visitors will be able to share their own immigration stories, discuss art with each other through interactive journals, and add their own images and stories to collages on display. The galleries will also feature many exhibits and media pieces that have been collaboratively produced with Californians from diverse backgrounds. The staff is also engaging visitors to help prototype new exhibit components in all galleries (including those like art in which visitor testing is not traditionally part of exhibit development). In some ways, it’s almost like having a community center in the museum. And I hesitate to put Days of the Dead in that box because it will be devalued. People will say that the artists that we bring on aren’t “artists,” they are “community artists.” This is a program that challenges the basic ideas about how art is displayed. We take an egalitarian approach, merging artists, community members, and school groups, so you will often see the work of an established artist right next to an installation of glitter-covered macaroni. And I think some museum people don’t know what to do with it. Days of the Dead’s co-creative format is a radical departure from the way things are typically done in a traditional museum. As part of the Oakland Museum’s redesign, Orantes and her colleagues in the education department have been working collaboratively with curators, researchers, and designers to share their knowledge about visitor needs and designing participatory projects. As museum director Lori Fogarty noted, “This is an institutional capacity-building effort. It takes a very different kind of skill set and staff roles to engage with visitors in these ways.” By sharing their experience, the staff members who manage Days of the Dead are helping make the whole museum a welcoming place for visitor participation. Co-creative projects allow cultural institutions to form partnerships that are responsive to the needs and interests of their audiences. Of course, visitors walk into museums with their own needs and interests every day. When staff members are attentive to and interested in accommodating these needs, they can design programs to invite visitors to use the space for their own reasons without entering extensive co-creative partnerships. These projects fall into the hosted model for participation, which is the topic of Chapter 9. Download A Catalyst for Change: The Social Impact of the Open Museum here [PDF]. This quote from Chew was published by the Community Arts Network here. 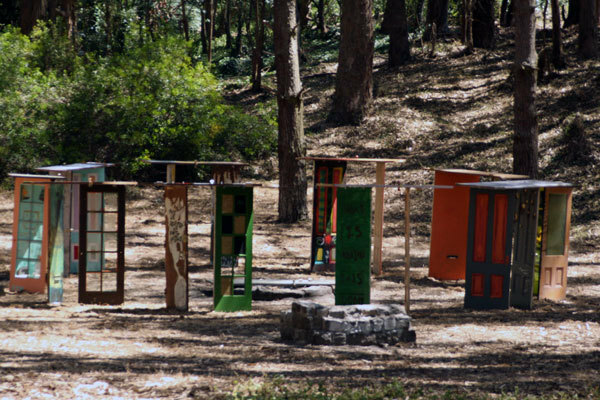 The Wing Luke Community-based Exhibition Model handbook is available both in print and online. These indicators were published by the Community Arts Network here. You can play SFZero online. Read Sweeney’s April 2009 blog post, Wikipedia Loves Art: Lessons Learned Part 4: The Stats. Read de Lusenet’s entire comment on my January 2010 blog post, Is Wikipedia Loves Art Getting Better? Your “Catalyst for Change” links in footnote 1 don’t lead to a PDF, just the homepage for the Glasgow Museum. Is there another place to get this resource? @Beth: Hm… it looks like they changed their website and removed the report. I will store the PDF elsewhere on the web and update the link tonight for the footnote… thanks for pointing this out!